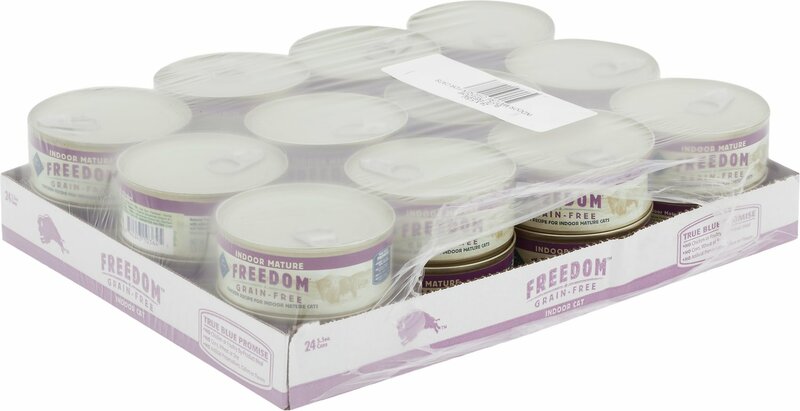 Feed your wise kitty’s wild side with the high-protein nutrition of Blue Buffalo Freedom Indoor Mature Chicken Recipe Grain-Free Canned Cat Food. Made with real chicken as the first ingredient and zero grains, wheat or by-products, it packs a powerful protein punch to support your little hunter’s wild pursuits and satisfy his cravings for meat in every bowl. It’s loaded with vitamins, minerals and taurine to help maintain overall health, and naturally-sourced omegas to nourish a healthy skin and lustrous coat. Plus, since it’s made with real broth, it helps keep your pal hydrated to support digestive and urinary health. Serve up as a complete meal or delicious kibble topper and watch his inner lynx lick his whiskers with every bite. 100% grain-free senior recipe starts with protein-rich chicken as the first ingredient to support healthy muscle growth and development. Helps promote digestive and urinary health with essential moisture from real broth and cranberries. Good source of omega-3 and 6 fatty acids sourced from flaxseeds to help promote a healthy skin and coat. Chicken, Chicken Broth, Chicken Liver, Carrots, Sweet Potatoes, Natural Flavor, Cellulose, Flaxseed (Source of Omega 3 and 6 Fatty Acids), Guar Gum, Potassium Chloride, Cranberries, Blueberries, Taurine, Carrageenan, Cassia Gum, Salt, Choline Chloride, Iron Amino Acid Chelate, Zinc Amino Acid Chelate, Vitamin E Supplement, Thiamine Mononitrate (Vitamin B1), Copper Amino Acid Chelate, Manganese Amino Acid Chelate, Sodium Selenite, Niacin Supplement (Vitamin B3), Calcium Pantothenate (Vitamin B5), Pyridoxine Hydrochloride (Vitamin B6), Riboflavin Supplement (Vitamin B2), Vitamin A Supplement, Biotin (Vitamin B7), Potassium Iodide, Vitamin D3 Supplement, Vitamin B12 Supplement, Folic Acid (Vitamin B9). 3 oz Can: Feed 2 cans per 6 - 8 lbs body weight per day. 5.5 oz Can: Feed 1 can per 6 - 8 lbs of body weight per day. BLUE Freedom always features high-quality real meat and healthy fruits. Like all BLUE foods, it's made from the finest natural ingredients enhanced with vitamins and minerals. With flavors and recipes inspired by wholesome, homestyle cooking, you'll find a large variety of wonderful wet foods all formulated to support your cat's health and well-being through every life stage. Savory cuts of delicious real meat in tempting textures to please the most finicky feline palates. Try them both! My cat has always been a picky eater, especially over wet food. He is 10 now and has developed sensitivities to grain so his vet said we need to find a grain free wet food. After trying many many different foods, finally he ate the Blue Freedom mature. He even begs for it. I’m happy we finally found something he’ll eat. It doesn’t stink like a lot of wet cat food either, maybe that’s why he likes it. I bought this for an 18-year-old cat that had grown extremely gaunt. Unfortunately I also have 1 and 2 year old cats who come running whenever I open a can so I give the young cats a taste and, they all love it, even the dog relishes licking the spoon. I give the bulk of each can to my 18-year-old, and he eats it with gusto. He seems to be gaining back weight, and within two or three days his old coat became glossy again. It seems like he’s digesting it well, he’s definitely throwing up less, and his prior horrid breath smells much better. And he seems more active so i think he’s getting nutrients his prior diet lacked. After trying many different products, this Blue Buffalo canned food does exactly what it says. Helped my indoor and very mature cat with her constipation issues. We are all happier! I adopted a pair of 12 year old goobers from a friend who's ex-MIL had passed. When we took them in they had been being fed Friskies. When I looked at the ingredients on the bag I was shocked how bad it was, no wonder they only slept and their coats were shabby. I switched them over to this food and I'm supplementing with the Blue Buffalo Dry Evolution Diet for Mature cats, and it's like night and day. Their coats are shiny and healthy, and they are so much more active and playful now. It's so important for cats to have a diet that their bodies can actually process as obligate carnivores, and this is the best food I've found outside of cooking my own. His first time to eat this food was amazing. He ate almost 2 cans like he was starved. We have never seen him gobble food down that fast. He likes it better than anything he has ever eaten. 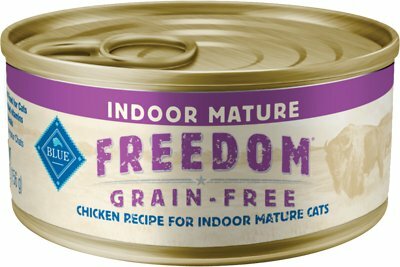 I'd definitely recommend Blue Buffalo Freedom Indoor Mature Chicken. My two 14 year old kitties really like this canned food (they are finicky so that says a lot). Since this was pate, my kitties were not as fond of it, vs. a different style. I will definitely order this brand in a chunkier version. However regarding flavor, the kitties licked it all up. My cats love this product. They are very finicky but as soon as I put this down for them they loved it. 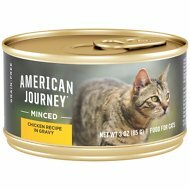 Have been searching for a high quality canned food for my picky eaters. Each of the cats love this and, most importantly, my cat with GI issues can eat this without throwing it up 10 minutes later. This cat food exceeded my expectations in every way, most notably, the smell! It smells like FOOD. 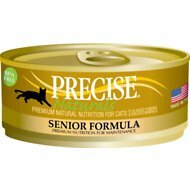 I tried it for my aging cat with a thyroid condition, and she loves it. My other 2 younger cats enjoy it as well. Good clean, quality ingredients at a comparable price.